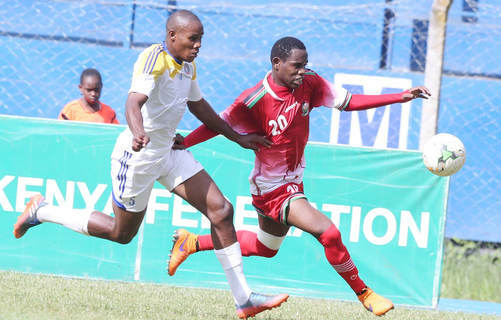 Sebastien Migne started his spell as Harambee Stars coach on a sour note, losing 1-0 to Swaziland in a friendly match in Machakos on Friday evening in Machakos. Substitute Wonder Nhleko’s low finish in the 79th minute made the difference, Stars punished for failing to make use of their massive possession. The home side had three close chances, two of which came off the crossbar as they failed to hit the back of the net with the handful of fans at the stadium clearly expressing their disappointment. It was a slow start to the match with both sides seeming cautious, none of them injecting pace to get in the much needed goal. In the 10th minute though, a cross from Whyvonne Isuza on the right was almost turned into an own goal by Lindo Mkhonta but the keeper managed to collect the ball before it diverted further. Swaziland should have gone ahead a few minutes later but Felix Bendenhorst could not connect inside the box with only Boniface Oluoch to beat from a Barry Steenkamp cross. The visitors had another chance in the 22nd minute when an error from debutant Michael Kibwage gifted Steenkamp the ball, but the winger had a heavy second touch allowing Oluoch to come off his line and pick the ball. Stars bossed possession, but nonetheless didn’t have much to brag for in the duration they had the ball. They should have however had an opening goal in the 26th minute when Ovella Ochieng was sent through by Whyvonne Isuza, but he could not beat the Swazi keeper one on one, the shot stopper making a good save at full stretch. In the second half Migne decided to play his cards, pulling out Kibwage for lanky striker Piston Mutamba. 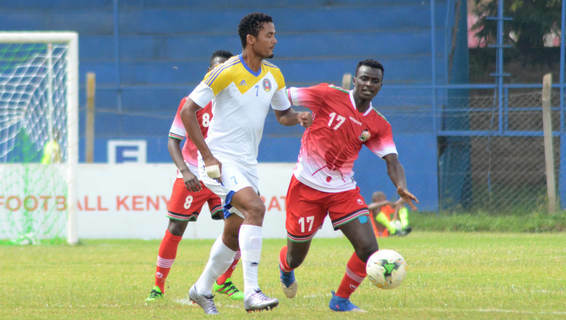 The change meant that Jockins Atudo moved into centre-back from right back while Philemon Otieno who had started on the right side of attack dropped back to right back. Mutamba went straight into the target man position and the forward almost broke the deadlock when he took a stinging low shot from the edge of the box but the effort went wide. On the opposite end, a lapse in defense saw Steenkamp break through behind the defense and tried to chip the ball over Oluoch, but the keeper was alert and read the attempt early. Migne’s charges continued to press and in the 67th minute they came inches close when Ovella’s freekick kissed the upside of the bar. On the other end, a long range shot from Tony Tsabedze almost caught Oluoch off guard but the keeper managed to leap to his right and save. Swaziland pressed more than they did in the first half and they were rewarded 11 minutes from time when when Nhleko picked the ball unmarked inside the box from a Steenkamp cross, shooting low past Oluoch. After going down, Migne made other changes with Bolton Omwenga coming on for Kahata. Omwenga almost made an immediate impact sending a well curled freekick from the left which found Mutamba isolated in the box, the striker sending in a header that rattled the crossbar. Despite increased pressure, there was no respite for Stars and Migne.